The warranties cover all malfunctions and defects encountered in normal use of the product. DCI will repair or replace defective equipment with new or factory refurbished parts or equipment of equal or greater value at our discretion and when available*. All product warranties are for a period of two (2) years from the date of original purchase. Longer warranty period may be available on certain products and are advertised on our website or in our catalog. Some of the products that DCI resells from other manufacturers (such as Panasonic, Nitek, Busch, etc.) are provided with warranties directly from the applicable branded manufacturer. We pass those warranties through to you; however we make no further warranties for such branded products regarding direct replacement or repairs. NOTE: Products labeled “Close-out” or “Specially Priced” will not be covered under this product warranty. Loss or damage to the equipment due to abuse causing deterioration, mishandling, accident, act of nature (i.e. lightning, fire, excessive smoke or dust, etc.) or failure to follow operating or proper installation instructions. 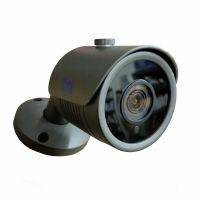 If the equipment has been serviced or modified by anyone other than DVR Connection, Inc (DCI) service personnel. Malfunction resulting from the direct or indirect use of accessories, attachments, product supplies, parts or devices that do not conform or follow the operating instructions. Compatibility issues with respect to certain software or hardware accessories. Damage resulting during shipment (Claims must be initiated by the shipper and processed through the courier). Any product modified from its original factory condition (including cutting wires or the addition or removal of any component such as hard drives, fans, peripherals, etc) will void your warranty. NOTE: Shipping charges to DCI for returned products are the responsibility of the customer. * Once a product has been returned on a warranty claim, DCI will promptly inspect the product to determine if the mentioned problem exists and if is covered under this warranty. DCI will charge the customer returning the product for warranty a $40 non-refundable diagnostic fee if the product is determined to be in working condition or that the returned product has problems not covered by the above warranty. DCI service department will provide an estimate of the cost of repairs or replacement for customer’s approval. If the customer chooses not to have a non-warranty repair made, we will dispose of the product or return it to you at your expense if you so request. If we determine that a product defect is covered by this warranty, we will repair it at no charge or, at our option, replace it with a product of like functionality. We offer a Thirty (30) day money back guarantee on all new and resalable products including DVR servers. If you are not completely satisfied with the product, merchandise can be returned within thirty (30) days of purchase with an approved RMA number in new, unmodified and resalable condition with all original packaging material, documentation and accessories included for a refund, exchange or credit, excluding the shipping cost. If products are not returned in proper condition, DCI may refuse the return or charge a 20% re-stocking fee. Special orders, custom built items and opened software may not be returned or may incur additional charges. Credit will be issued to accounts in current status only. Past due invoices must be paid in full before any credit will be issued. DCI assumes no risk and shall not be liable for any damage or loss resulting from the use or application made of the products purchased. DCI’s liability for any claim shall not exceed the price paid by the customer to DCI for such products, whether based on negligence, breach of contract, infringement of any rights of any party or product liability, relating to the products purchased. DCI will not, in any event be liable for any special, incidental or consequential damages (including but not limited to loss of use, loss of profit and claims of third parties) however caused, whether by the negligence of DCI or otherwise. It is the responsibility of the buyer, not DCI, to determine the legality and conform to all federal, state, and local laws and regulations regarding the purchase, possession, and/or use of the products/equipment that we offer. By placing an order with DCI, the buyer represents that he/she has complete knowledge of all federal, state and local laws and regulations to receive the products/equipment ordered and that the products/equipment will only be used in a legal and lawful manner in accordance with all applicable federal, state, and local laws and regulations. Any liability and/or damage resulting from the misuse and/or unlawful use of any of the products/equipment that we offer are that of the buyer, not DVR Connection, Inc.